Updated, with links to a related article and additional posts, and republished. the great and rapid advance of the physical sciences took place in fields where it proved that explanation and prediction could be based on laws which accounted for the observed phenomena as functions of comparatively few variables. Hayek’s particular target was the scientism then (and still) rampant in economics. In particular, there was (and is) a quasi-religious belief in the power of central planning (e.g., regulation, “stimulus” spending, control of the money supply) to attain outcomes superior to those that free markets would yield. There is danger in the exuberant feeling of ever growing power which the advance of the physical sciences has engendered and which tempts man to try, “dizzy with success” … to subject not only our natural but also our human environment to the control of a human will. The recognition of the insuperable limits to his knowledge ought indeed to teach the student of society a lesson of humility which should guard him against becoming an accomplice in men’s fatal striving to control society – a striving which makes him not only a tyrant over his fellows, but which may well make him the destroyer of a civilization which no brain has designed but which has grown from the free efforts of millions of individuals. Every serious forecast looked like this — Fed, yes, but also CBO, private forecasters, and the term structure of forward rates. Everyone has expected bounce-back growth and rise in interest rates to start next year, for the last 6 years. And every year it has not happened. Welcome to the slump. Every year, Sonny and Cher wake us up, and it’s still cold, and it’s still grey. But we keep expecting spring tomorrow. Whether the corrosive effects of government microeconomic and regulatory policy, or a failure of those (unprintable adjectives) Republicans to just vote enough wasted-spending Keynesian stimulus, or a failure of the Fed to buy another $3 trillion of bonds, the question of the day really should be why we have this slump — which, let us be honest, no serious forecaster expected. 1) No Recent Warming. If global warming science is so “settled”, why did global warming stop over 15 years ago (in most temperature datasets), contrary to all “consensus” predictions? 2) Natural or Manmade? If we don’t know how much of the warming in the longer term (say last 50 years) is natural, then how can we know how much is manmade? 3) IPCC Politics and Beliefs. Why does it take a political body (the IPCC) to tell us what scientists “believe”? And when did scientists’ “beliefs” translate into proof? And when was scientific truth determined by a vote…especially when those allowed to vote are from the Global Warming Believers Party? 4) Climate Models Can’t Even Hindcast How did climate modelers, who already knew the answer, still fail to explain the lack of a significant temperature rise over the last 30+ years? In other words, how to you botch a hindcast? 5) …But We Should Believe Model Forecasts? Why should we believe model predictions of the future, when they can’t even explain the past? 6) Modelers Lie About Their “Physics”. Why do modelers insist their models are based upon established physics, but then hide the fact that the strong warming their models produce is actually based upon very uncertain “fudge factor” tuning? 7) Is Warming Even Bad? Who decided that a small amount of warming is necessarily a bad thing? 8) Is CO2 Bad? How did carbon dioxide, necessary for life on Earth and only 4 parts in 10,000 of our atmosphere, get rebranded as some sort of dangerous gas? 9) Do We Look that Stupid? How do scientists expect to be taken seriously when their “theory” is supported by both floods AND droughts? Too much snow AND too little snow? 10) Selective Pseudo-Explanations. How can scientists claim that the Medieval Warm Period (which lasted hundreds of years), was just a regional fluke…yet claim the single-summer (2003) heat wave in Europe had global significance? 11) (Spinal Tap bonus) Just How Warm is it, Really? Why is it that every subsequent modification/adjustment to the global thermometer data leads to even more warming? What are the chances of that? 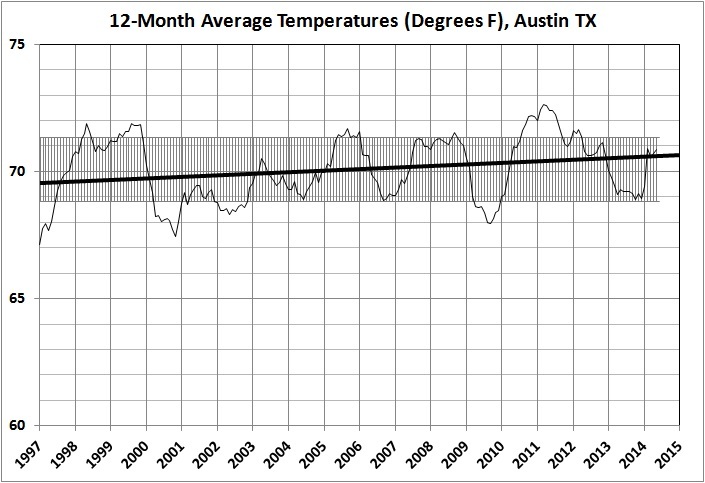 Either a warmer-still present, or cooling down the past, both of which produce a greater warming trend over time. And none of the adjustments take out a gradual urban heat island (UHI) warming around thermometer sites, which likely exists at virtually all of them — because no one yet knows a good way to do that. It is no coincidence that leftists believe in the efficacy of central planning and cling tenaciously to a belief in catastrophic anthropogenic global warming. The latter justifies the former, of course. And both beliefs exemplify the left’s penchant for magical thinking, about which I’ve written several times (e.g., here, here, here, here, and here). Magical thinking is the pretense of knowledge in the nth degree. It conjures “knowledge” from ignorance and hope. And no one better exemplifies magical thinking than our hopey-changey president. Reduced to its essence, the precautionary principle (PP) is this: Avert calamity regardless of the cost of doing so. The thinking person, as opposed the the extreme environmentalist or global-warming zealot, will immediately and carefully pose these questions about the PP: What, specifically, is the calamity to be averted? How might it be averted? With what degree of certainty? What are the opportunity and monetary costs of the options? Take death, for example. Most persons who are in good health (and even many who are in declining health) consider death to be a calamity. So, too, do their loved ones (usually). How, then, might death be averted, with what degree of certainty, and at what cost? Death can be averted only temporarily. That is, death often can sometimes be postponed, but never defeated. So the question is how can it be postponed, and at what cost. Let’s take an extreme case of a man dying of a virulent cancer (confirmed by extensive tests and procedures) for which there is no known treatment, other than palliative care. What good will it do that man (or his heirs) to spend his fortune in search of cure for his disease? He will almost certainly die before a possible cure is identified and can be supplied to him. But in funding the search for a cure he would have followed the PP by doing his utmost to avoid the calamity of death, without regard for the calamity thereby visited upon upon his heirs. the cost of ameliorating the calamity is itself calamitous. Extreme environmentalists and global-warming zealots are guilty of sub-optimizing. They focus on particular calamities, not on the big picture of human flourishing. Take global warming. It has been said many times that warming has many advantages, such as a longer growing season and a lower death rate (cold is a bigger killer than heat). It has also been shown that warming hasn’t been occurring as fast as projected. The over-estimation of warming is probably due to (a) overstatement of the effects of CO2 emissions on temperatures and (b) inadequate modeling that omits key factors. But the zealots remain undeterred by such considerations. The only thing that’s saving humanity from total impoverishment at the hands of global-warming zealots is the ridiculously high cost of (probably futile) efforts to combat global warming. Shutting down coal mines is bad enough, though tolerable given the advances that have been made in the extraction of natural gas and oil. But there is little taste (except among well-fed elites) for shutting down factories, forcing everyone to drive battery-powered cars, shifting to high-cost and unreliable sources of energy (solar, wind, and hydro), forcing people to live in densely populated cities, and so on. And if all of those things were to happen, what difference would it make? Almost none. there were similar observed changes in global surface temperatures. It’s tough to claim that the recent global warming is unprecedented when surface temperatures rose at a comparable rate over a 30-year timespan that ended about 70 years ago. Second, climate models are not simulating climate as it existed in the past or present. The model mean of the climate models produced for the IPCC’s 5th Assessment Report simulates observed warming trends for one of the three periods shown in this post. Specifically, during the three global warming periods discussed in this post, climate models simulated three very different rates of warming (+0.050 deg C/decade for 1916-1946, +0.155 deg C/decade for 1964-1993, and +0.255 deg C/decade for 1986-2015), yet the data from GISS indicated the warming trends were very similar at +0.16 deg C/decade and +0.166 deg C/decade. If climate models can’t simulate global surface temperatures in the past or present, why should anyone have any confidence in their prognostications of future surface temperatures? Third, the models’ failure to simulate the rate of the observed early 20th Century warming from 1916-1945 indicates that there are naturally occurring processes that can cause global surfaces to warm over multi-decadal periods above and beyond the computer-simulated warming from the forcings used to drive the climate models [emphasis added]. 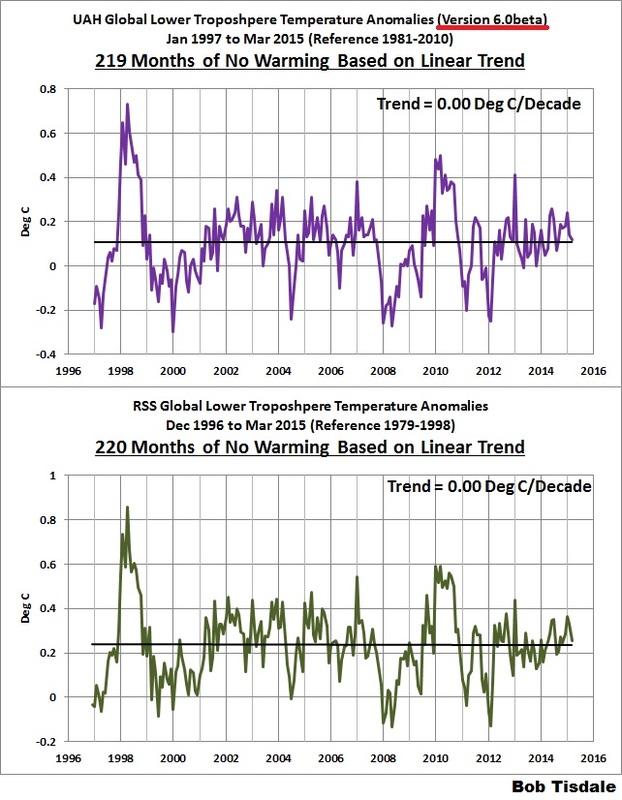 That of course raises the question, how much of the recent warming is also natural? Fourth, for the most-recent 30-year period (1986-2015), climate models are overestimating the warming by a noticeable amount. 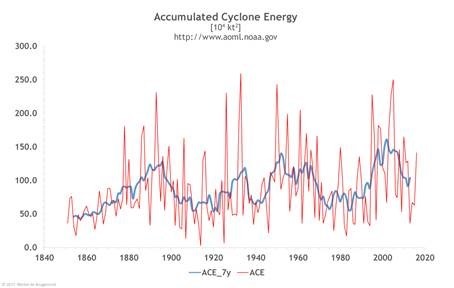 This, along with their failure to simulate warming from 1916-1945, suggests climate models are too sensitive to greenhouse gases and that their projections of future global warming are too high. Fifth, logically, the fact that the models seem to simulate the correct global-warming rate for one of the three periods discussed [1964-1993] does not mean the climate models are performing properly during the one “good” period. Do you freaking love science? Then you might be a big enough sucker to fall for a claim like this one: “Across the span of their lives, the average American is more than five times likelier to die during a human-extinction event than in a car crash.” Which was actually made by an environmentalist group called the Global Challenges Foundation and reported with a straight face in The Atlantic…. There is something that sounded familiar to me about this argument, and I realized that it borrows the basic form of Pascal’s Wager, an old and spectacularly unconvincing argument for belief in God. (Go here if you want to give the idea more thought than it probably deserves.) Blaise Pascal’s argument was that even if the existence of God is only a very small probability, the consequences are so spectacularly huge — eternal life if you follow the rules, eternal punishment if you don’t — that it makes even a very small probability seem overwhelmingly important. In effect, Pascal realized that you can make anything look big if you multiply it by infinity. Similarly, this new environmentalist argument assumes that you can make anything look big if you multiply it by extinction…. If Pascal’s probabilistic argument works for Christianity, then it also works for Islam, or for secular versions like Roko’s Basilisk. (And yes, an “all-seeing artificial intelligence” is included in this report as a catastrophic possibility, which gives you an idea of how seriously you should take it.) Or it works for global warming, which is exactly how it’s being used here. Pascal was a great mathematician, but this was an awful abuse of the nascent science of probabilities. (I suspect it’s no great shakes from a religious perspective, either.) First of all, a “probability” is not just anything that you sort of think might happen. Imagination and speculation are not probability. In any mathematical or scientific sense of the word, a probability is something for which you have a real basis to measure its likelihood. Saying you are “95 percent certain” about a scientific theory, as global warming alarmists are apt to do, might make for an eye-catching turn of phrase in press headlines. But it is not an actual number that measures something. This kind of Pascal’s-Wager-for-global-warming is part of a larger environmentalist program: a perverse attempt to take our sense of the actual risks and benefits for human life and turn it upside down. If we’re concerned about the actual dangers to human life, we don’t have to assume a bunch of bizarre probabilities. The big dangers are known quantities: poverty, squalor, disease, famine, dictatorship, war. And the solutions are also known quantities: technology, industrialization, economic growth, freedom. Across the span of their lives, the average American is more than five times likelier to die during a human-extinction event than in a car crash. A probability is a statement about a very large number of like events, each of which has an unpredictable (random) outcome. Probability, properly understood, says nothing about the outcome of an individual event. It certainly says nothing about what will happen next. The so-called 97-percent consensus among climate scientists about anthropogenic global warming (AGW) isn’t evidence of anything but the fact that scientists are only human. Even if there were such a consensus, it certainly wouldn’t prove the inchoate theory of AGW, any more than the early consensus against Einstein’s special theory of relativity disproved that theory. Actually, in the case of AGW, the so-called consensus is far from a consensus about the extent of warming, its causes, and its implications. (See, for example, this post and this one.) But it’s undeniable that a lot of climate scientists believe in a “strong” version of AGW, and in its supposedly dire consequences for humanity. Why is that? Well, in a field as inchoate as climate science, it’s easy to let one’s prejudices drive one’s research agenda and findings, even if only subconsciously. And isn’t it more comfortable and financially rewarding to be with the crowd and where the money is than to stand athwart the conventional wisdom? (Lennart Bengtsson certainly found that to be the case.) 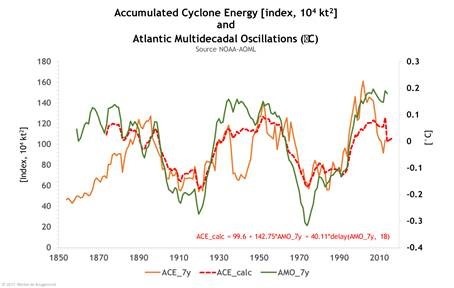 Moreover, there was, in the temperature records of the late 20th century, a circumstantial case for AGW, which led to the development of theories and models that purport to describe a strong relationship between temperature and CO2. That the theories and models are deeply flawed and lacking in predictive value seems not to matter to the 97 percent (or whatever the number is). In other words, a lot of climate scientists have abandoned the scientific method, which demands skepticism, in order to be on the “winning” side of the AGW issue. How did it come to be thought of as the “winning” side? Credit vocal so-called scientists who were and are (at least) guilty of making up models to fit their preconceptions, and ignoring evidence that human-generated CO2 is a minor determinant of atmospheric temperature. Credit influential non-scientists (e.g., Al Gore) and various branches of the federal government that have spread the gospel of AGW and bestowed grants on those who can furnish evidence of it. Above all, credit the media, which for the past two decades has pumped out volumes of biased, half-baked stories about AGW, in the service of the “liberal” agenda: greater control of the lives and livelihoods of Americans. Does this mean that the scientists who are on the AGW bandwagon don’t believe in the correctness of AGW theory? I’m sure that most of them do believe in it — to some degree. They believe it at least to the same extent as a religious convert who zealously proclaims his new religion to prove (mainly to himself) his deep commitment to that religion. The admirable part of Hayes’s statement is its candor: Hayes admits that he may have adopted the “consensus” answer because he wants to go with the crowd. Going with the crowd isn’t the way to do science. It’s certainly not the way to ascertain the contribution of human-generated CO2 to atmospheric warming, or to determine whether the effects of any such warming are dire or beneficial. And it’s most certainly not the way to decide whether AGW theory implies the adoption of policies that would stifle economic growth and hamper the economic betterment of millions of Americans and billions of other human beings — most of whom would love to live as well as the poorest of Americans. To what extent would the temperature rise be harmful and to what extent would it be beneficial? To what extent would mitigation of the harmful effects negate the beneficial effects? What would be the costs of mitigation, and who would bear those costs, both directly and indirectly (e.g., the effects of slower economic growth on the poorer citizens of thw world)? If warming does resume gradually, as before, why should government dictate precipitous actions — and perhaps technologically dubious and economically damaging actions — instead of letting households and businesses adapt over time by taking advantage of new technologies that are unavailable today? Those are not issues to be decided by scientists, politicians, and media outlets that have jumped on the AGW bandwagon because it represents a “consensus.” Those are issues to be decided by free, self-reliant, responsible persons acting cooperatively for their mutual benefit through the mechanism of free markets. “Science” is an unnecessarily daunting concept to the uninitiated, which is to say, almost everyone. Because scientific illiteracy is rampant, advocates of policy positions — scientists and non-scientists alike — often are able to invoke “science” wantonly, thus lending unwarranted authority to their positions. Science is knowledge, but not all knowledge is science. A scientific body of knowledge is systematic; that is, the granular facts or phenomena which comprise the body of knowledge are connected in patterned ways. Moreover, the facts or phenomena represent reality; they are not mere concepts, which may be tools of science but are not science. Beyond that, science — unless it is a purely descriptive body of knowledge — is predictive about the characteristics of as-yet unobserved phenomena. These may be things that exist but have not yet been measured (in terms of the applicable science), or things that are yet to be (as in the effects of new drug on a disease). Above all, science is not a matter of “consensus” — AGW zealots to the contrary notwithstanding. Science is a matter of rigorously testing theories against facts, and doing it openly. Imagine the state of physics today if Galileo had been unable to question Aristotle’s theory of gravitation, if Newton had been unable to extend and generalize Galileo’s work, and if Einstein had deferred to Newton. The effort to “deny” a prevailing or popular theory is as old as science. There have been “deniers’ in the thousands, each of them responsible for advancing some aspect of knowledge. Not all “deniers” have been as prominent as Einstein (consider Dan Schectman, for example), but each is potentially as important as Einstein. It is hard for scientists to rise above their human impulses. Einstein, for example, so much wanted quantum physics to be deterministic rather than probabilistic that he said “God does not play dice with the universe.” To which Nils Bohr replied, “Einstein, stop telling God what to do.” But the human urge to be “right” or to be on the “right side” of an issue does not excuse anti-scientific behavior, such as that of so-called scientists who have become invested in AGW. There are many so-called scientists who subscribe to AGW without having done relevant research. Why? Because AGW is the “in” thing, and they do not wish to be left out. This is the stuff of which “scientific consensus” is made. If you would not buy a make of automobile just because it is endorsed by a celebrity who knows nothing about automotive engineering, why would you “buy” AGW just because it is endorsed by a herd of so-called scientists who have never done research that bears directly on it? There are two lessons to take from this. The first is that no theory is ever proven. (A theory may, if it is well and openly tested, be useful guide to action in certain rigorous disciplines, such as engineering and medicine.) Any theory — to be a truly scientific one — must be capable of being tested, even by (and especially by) others who are skeptical of the theory. Those others must be able to verify the facts upon which the theory is predicated, and to replicate the tests and calculations that seem to validate the theory. So-called scientists who restrict access to their data and methods are properly thought of as cultists with a political agenda, not scientists. Their theories are not to be believed — and certainly are not to be taken as guides to action. The second lesson is that scientists are human and fallible. It is in the best tradition of science to distrust their claims and to dismiss their non-scientific utterances. Mathematics and statistics are not sciences, despite their vast and organized complexity. They offer ways of thinking about and expressing knowledge, but they are not knowledge. They are languages that enable scientists to converse with each other and outsiders who are fluent in the same languages. Expressing a theory in mathematical terms may lend the theory a scientific aura. But a theory couched in mathematics (or its verbal equivalent) is not a scientific one unless (a) it can be tested against observable facts by rigorous statistical methods, (b) it is found, consistently, to accord with those facts, and (c) the introduction of new facts does not require adjustment or outright rejection of the theory. If the introduction of new facts requires the adjustment of a theory, then it is a new theory, which must be tested against new facts, and so on. This “inconvenient fact” — that an adjusted theory is a new theory — is ignored routinely, especially in the application of regression analysis to a data set for the purpose of quantifying relationships among variables. If a “model” thus derived does a poor job when applied to data outside the original set, it is not an uncommon practice to combine the original and new data and derive a new “model” based on the combined set. This practice (sometimes called data-mining) does not yield scientific theories with predictive power; it yields information (of dubious value) about the the data employed in the regression analysis. As a critic of regression models once put it: Regression is a way of predicting the past with great certainty. A science may be descriptive rather than mathematical. In a descriptive science (e.g., plant taxonomy), particular phenomena sometimes are described numerically (e.g., the number of leaves on the stem of a species), but the relations among various phenomena are not reducible to mathematics. Nevertheless, a predominantly descriptive discipline will be scientific if the phenomena within its compass are connected in patterned ways. History, by my reckoning, is not a science. But a knowledge of history is valuable, nevertheless, for the insights it offers into the influence of human nature on the outcomes of economic and political processes. I call the lessons of history “insights,” not scientific relationships, because history is influenced by so many factors that it does not allow for the rigorous testing of hypotheses. Physics is a science in most of its sub-disciplines, but there are some (e.g., cosmology and certain interpretations of quantum mechanics) where it descends into the realm of speculation. Informed, fascinating speculation to be sure, but speculation all the same. It avoids being pseudo-scientific only because it might give rise to testable hypotheses. Economics is a science only to the extent that it yields valid, statistical insights about specific microeconomic issues (e.g., the effects of laws and regulations on the prices and outputs of goods and services). The postulates of macroeconomics, except to the extent that they are truisms, have no demonstrable validity. (See, for example, my treatment of the Keynesian multiplier.) Macroeconomics is a pseudo-science. If there is an ultimate pseudo-science it is exemplified in the line of thought, originated by Ayn Rand, known as Objectivism. Among its egregious emissions is the theory that “natural rights” are a product of evolution. There is no such thing as “science,” writ large; that is, no one may appeal, legitimately, to “science” in the abstract. A particular discipline may be a science, but it is a science only to the extent that it comprises a factual body of knowledge and testable theories. Further, its data and methods must be open to verification and testing. And only a particular theory — one that has been put to the proper tests — can be called a scientific one. For the reasons adduced in this post, scientists who claim to “know” that there is no God are not practicing science when they make that claim. They are practicing the religion that is known as atheism. The existence or non-existence of God is beyond testing, at least by any means yet known to man. There are four kinds of truth: physical, logical-mathematical, psychological-emotional, and judgmental. The first two are closely related, as are the last two. After considering each of the two closely related pairs, I will link all four kinds of truth. Physical truth is, seemingly, the most straightforward of the lot. Physical truth seems to consist of that which humans are able to apprehend with their senses, aided sometimes by instruments. And yet, widely accepted notions of physical truth have changed drastically over the eons, not only because of improvements in the instruments of observation but also because of changes in the interpretation of data obtained with the aid of those instruments. To put it another way, logical-mathematical truth is only as valid as the axioms (principles) from which it is derived. Given an axiom, or a set of them, one can deduce “true” statements (assuming that one’s logical-mathematical processes are sound). But axioms are not pre-existing truths with independent existence (like Platonic ideals). They are products, in one way or another, of observation and reckoning. The truth of statements derived from axioms depends, first and foremost, on the truth of the axioms, which is the thrust of Chesterton’s aperçu. Induction is “The process of deriving general principles from particular facts or instances.” That is how scientific theories are developed, in principle. A scientist begins with observations and devises a theory from them. Or a scientist may begin with an existing theory, note that new observations do not comport with the theory, and devise a new theory to fit all the observations, old and new. Deduction is “The process of reasoning in which a conclusion follows necessarily from the stated premises; inference by reasoning from the general to the specific.” That is how scientific theories are tested, in principle. A theory (a “stated premise”) should lead to certain conclusions (“observations”). If it does not, the theory is falsified. If it does, the theory lives for another day. But the stated premises (axioms) of a scientific theory (or exercise in logic or mathematical operation) do not arise out of nothing. In one way or another, directly or indirectly, they are the result of observation and reckoning (induction). Get the observation and reckoning wrong, and what follows is wrong; get them right and what follows is right. Chesterton, again. A psychological-emotional truth is one that depends on more than physical observations. A judgmental truth is one that arises from a psychological-emotional truth and results in a consequential judgment about its subject. A common psychological-emotional truth, one that finds its way into judgmental truth, is an individual’s conception of beauty. The emotional aspect of beauty is evident in the tendency, especially among young persons, to consider their lovers and spouses beautiful, even as persons outside the intimate relationship would find their judgments risible. A close parallel is found in the linkage between the psychological-emotional truth that underlies a jury’s verdict and the legal truth of a judge’s sentence. There is an even tighter linkage between psychological-emotional truth and legal truth in the deliberations and rulings of higher courts, which operated without juries. Psychological-emotional proclivities, and the judgmental truths that arise from them, impinge on physical and mathematical-logical truth. Because humans are limited (by time, ability, and inclination), they often accept as axiomatic statements about the world that are tenuous, if not downright false. Scientists, mathematicians, and logicians are not exempt from the tendency to credit dubious statements. And that tendency can arise not just from expediency and ignorance but also from psychological-emotional proclivities. Albert Einstein, for example, refused to believe that very small particles of matter-energy (quanta) behave probabilistically, as described by the branch of physics known as quantum mechanics. Put simply, sub-atomic particles do not seem to behave according to the same physical laws that describe the actions of the visible universe; their behavior is discontinuous (“jumpy”) and described probabilistically, not by the kinds of continuous (“smooth”) mathematical formulae that apply to the macroscopic world. Einstein refused to believe that different parts of the same universe could operate according to different physical laws. Thus he saw quantum mechanics as incomplete and in need of reconciliation with the rest of physics. At one point in his long-running debate with the defenders of quantum mechanics, Einstein wrote: “I, at any rate, am convinced that He [God] does not throw dice.” And yet, quantum mechanics — albeit refined and elaborated from the version Einstein knew — survives and continues to describe the sub-atomic world with accuracy. Ironically, Einstein’s two greatest contributions to physics — special and general relativity — were met with initial skepticism by other physicists. Special relativity rejects absolute space-time; general relativity depicts a universe whose “shape” depends on the masses and motions of the bodies within it. These are not intuitive concepts, given man’s instinctive preference for certainty. The point of the vignettes about Einstein is that science is not a sterile occupation; it can be (and often is) fraught with psychological-emotional visions of truth. What scientists believe to be true depends, to some degree, on what they want to believe is true. Scientists are simply human beings who happen to be more capable than the average person when it comes to the manipulation of abstract concepts. And yet, scientists are like most of their fellow beings in their need for acceptance and approval. They are fully capable of subscribing to a “truth” if to do otherwise would subject them to the scorn of their peers. Einstein was willing and able to question quantum mechanics because he had long since established himself as a premier physicist, and because he was among that rare breed of humans who are (visibly) unaffected by the opinions of their peers. Such are the scientists who, today, question their peers’ psychological-emotional attachment to the hypothesis of anthropogenic global warming (AGW). The questioners are not “deniers” or “skeptics”; they are scientists who are willing to look deeper than the facile hypothesis that, more than two decades ago, gave rise to the AGW craze. It was then that a scientist noted the coincidence of an apparent rise in global temperatures since the late 1800s (or is it since 1975?) and an apparent increase in the atmospheric concentration of CO2. And thus a hypothesis was formed. It was embraced and elaborated by scientists (and others) eager to be au courant, to obtain government grants (conveniently aimed at research “proving” AGW), to be “right” by being in the majority, and — let it be said — to curtail or stamp out human activities which they find unaesthetic. Evidence to the contrary be damned. Where else have we seen this kind of behavior, albeit in a more murderous guise? At the risk of invoking Hitler, I must answer with this link: Nazi Eugenics. Again, science is not a sterile occupation, exempt from human flaws and foibles. What is truth? Is it an absolute reality that lies beyond human perception? Is it those “answers” that flow logically or mathematically from unproven assumptions? Is it the “answers” that, in some way, please us? Or is it the ways in which we reshape the world to conform it with those “answers”? Truth, as we are able to know it, is like the human condition: fragile and prone to error.